I read this article and found it very interesting, thought it might be something for you. The article is called Campaign Statement – Trump’s Trigger-Happy War Cabinet Versus Socialist Internationalism and is located at https://votesocialism.com/trumps-trigger-happy-war-cabinet-versus-socialist-internationalism/. With President Trump’s appointment of John Bolton as his new national security adviser, the administration has ratcheted up its determination to drag U.S. workers into yet another major war. 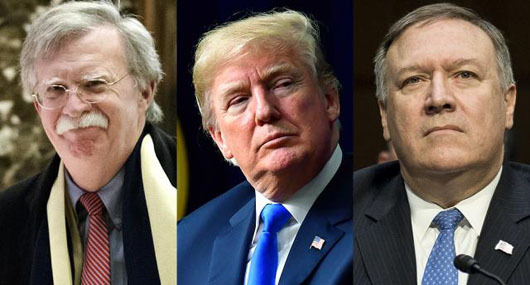 Bolton, who has advocated bombing Iran and attacking North Korea, is not the only super-hawk set to replace already war-inclined Cabinet members. To take over for the ousted Rex Tillerson as Secretary of State, Trump has nominated Mike Pompeo, staunch Islamophobe and torture supporter. A proven liar like his boss, John Bolton can never be expected to acknowledge that deaths on the global battlefield are all about strengthening Wall Street’s international dominance. The Freedom Socialist Party (FSP) campaign of Steve Hoffman for U.S. Senate from Washington state, on the other hand, tells the truth about U.S. wars. They are imperialist wars — wars for empire. They are the product of an economic system of cutthroat competition for profit, where all options are on the table, as the politicians like to put it. Unlike many capitalist politicians, who temper their support for imperialist war with calls to first try “diplomacy,” Bolton cuts to the chase. Itching to pull the trigger, he has little patience for diplomacy. He helped George W. Bush manufacture the lie about Saddam Hussein’s alleged weapons of mass destruction. Now, in addition to calling for war against North Korea and Iran, he has said that people “should also expect an even more confrontational approach” in U.S. relations with China. Most Democratic officials are among those with a reputation for trying to give diplomacy a chance. However, together with Republicans, they vote year after year for war funding and military appropriations. The most recent Pentagon budget is $700 billion, the largest ever. It was eventually passed in March with the support of a majority of Democrats in both the House and the Senate. Steve Hoffman’s Democratic Party opponent, Maria Cantwell, was among them, staying true to a record of consistently voting “yea” to the enormous military spending wreaking havoc and misery around the world. FSP’s Hoffman recognizes that the U.S. government strengthens its global hand through its foreign policy in the diplomatic and economic spheres as well as through outright military adventures. For allies like Israel and Saudi Arabia, foreign policy means billions in arms sales. For political enemies, like North Korea and Iran, it means murderous economic sanctions. For competitors like China, it means economic tariffs. As a U.S. Navy veteran, Hoffman has seen firsthand the enormous resources spent on the weapons of war. He believes that U.S. workers, the poor, and small-business people have no stake in supporting the government’s bipartisan wars, occupations, and saber-rattling. On the contrary, the shared interest of working people at home is with their counterparts around the world. To achieve the urgently desired common goal of peace, Hoffman and the FSP campaign call for defunding the Pentagon, bringing home U.S. troops worldwide, and ultimately replacing capitalism with socialism. This is the only way to eliminate the economic motivation for war and make it possible to meet the needs of people and protect the planet.